The T. Premier League is a Japanese professional table tennis league. 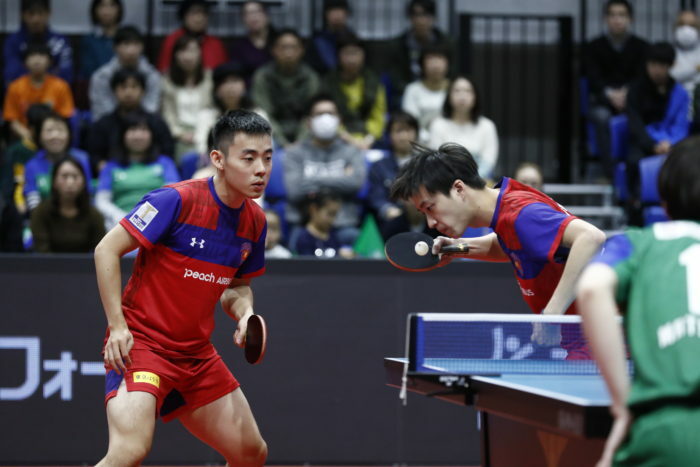 The season began in October 2018 and Okinawa’s own professional table tennis team, the Ryukyu Asteeda, will have their first home game on December 3rd (Mon.) at the Ginowan City Gym starting at 19:00. Table Tennis is a worldwide popular sport, with most people having played it at least once in their lifetime. In Japan, table tennis recently became more popular with the rise of several Japanese table tennis players like Ai Fukuhara, Kasumi Ishikawa, Sayaka Hirano, and Mima Ito who won the Women’s Silver Medals at the London Olympic and the Bronze Medals at the Rio Olympic. On the men’s side, Jun Mizutani won the Silver Medal, as well as the men’s group, won the Bronze Medals at the Rio Olympics. These recent showings have given much attention to the sport of table tennis and more recently, to the T. Premier League. The league debuted in 2018 with the season starting from October and ending in March. As of now, there are only 4 men’s teams and 4 women’s teams. Each team will face the other 3 times during a season, for a total of 21 games. They have home and away games, as well as what they call a “central game” which is at a neutral location to determine the season’s third place winner. Only the top 2 teams will face off at the end to determine that year’s champion. When teams face off, they have to play 4 matches against each other; the first match consist of “Doubles” with 3 games, the second match is “Singles” with 5 games, the third match is “Singles” with 5 games, and the fourth and final match is again “Singles” with 5 games. If further games are required, then another sudden death round is added consisting of “Singles” for 1 game. The Ryukyu Asteeda was founded in 2013 in Okinawa and joined the T. League in 2018. The name “Asteeda” is a combination of two words; “Asu” (‘tomorrow’ in Japanese)” and “Teeda” (meaning ‘sun’ in the Okinawan dialect [sometimes spelled “tida”]). Together, these words mean “Shine Tomorrow”, a metaphor giving reference to “giving power and glory to the Okinawa table tennis team”! 2/11 (Mon.) Ryukyu vs. KM Tokyo at the Tomigusuku City Gym, starting Time TBD. 2/12 (Tue.) Ryukyu vs. KM Tokyo at the Tomigusuku City Gym, starting Time TBD. 2/21 Ryukyu vs. Okayama at the Ginowan City Gym, starting Time TBD. 2/22 Ryukyu vs. T.T. Saitama at the Ginowan City Gym, starting Time TBD.